We’re at the end of January… Is it too late to say Happy New Year? I think not, so, Happy New Year! I hope the new year is treating you well so far. 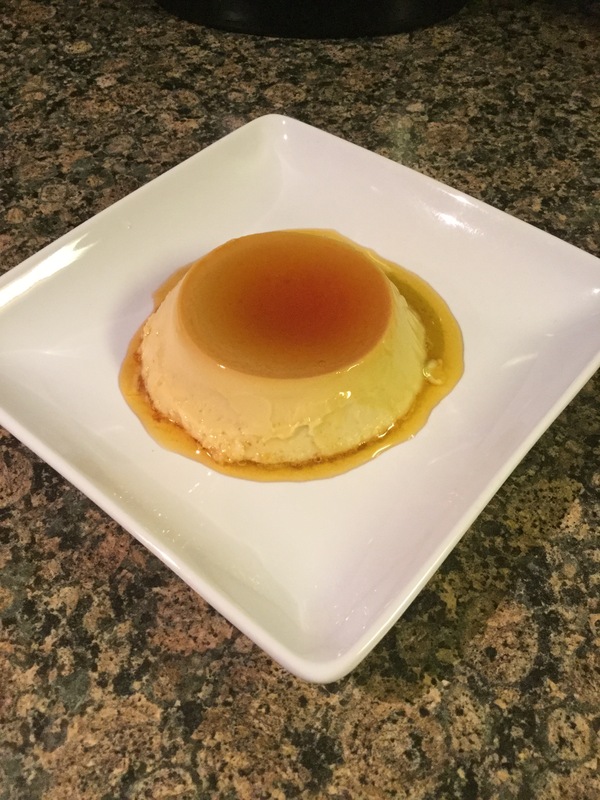 It took me three tries to get the caramel sauce right for this flan. The first time, I made it in a skillet and I let it sit on the flame a little too long and the color was dark and it had a slight burnt taste. The second time I used a saucepan and I don’t know what happened, but, it just wasn’t right. The third time I used a glass saucepan and once the sugar started to caramelize I lifted the pan off the heat so it wouldn’t be heating it directly and I finally got the color and taste right. I immediately divided it among my ramekins and it quickly hardened. I hadn’t made flan in a long time so I couldn’t remember if that was normal or not good. Thankfully, it was all good. I blended the ingredients for the custard and also divided that among the ramekins and baked in a roasting pan in a hot water bath and after letting them cool I had the perfect flan. It was the right consistency and the perfect amount of sweetness. Preheat oven to 350 F. In a large shallow roasting pan, place six 6oz. ramekins. In a heavy nonreactive pan pour the 1 cup of sugar and heat over medium heat. Stir constantly until sugar melts and becomes caramel colored, about 10 – 15 minutes. Pour caramel evenly into ramekins. In a blender combine the condensed milk, evaporated milk, whole milk, eggs, egg yolks, vanilla and salt and blend until mixture is smooth. Strain the mixture, then pour over the caramel in the ramekins. Place the roasting pan in the oven and fill the pan with 1 inch of hot water. Bake for about 30 minutes, until the center of each flan is set. Remove pan from oven and let cool. When the water reaches room temperature remove the ramekins, cover with plastic wrap and refrigerate for 2 to 3 hours. Gently run a knife around the edge of the flan to loosen and then invert on a plate.